Do You Trust the Republican Party to Protect, Promote, and Defend Liberty? While I have strongly praised the GOP for embracing entitlement reform and supporting the Ryan budget, I’m not under any illusions that the average Republican politician is fully committed to free markets and limited government. Even after the Tea Party election of 2010, there have been some very disappointing moments. 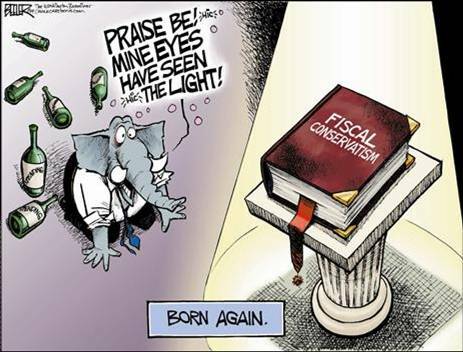 Republicans have been using Keynesian arguments to oppose budget cuts. Republicans have expanded federal transportation funding. Republicans have increased the budget of the Export-Import Bank. Republicans have boosted subsidies for housing. This doesn’t mean that GOPers are hopeless, but it does confirm my point that almost all politicians are a combination of good and bad impulses. It’s sort of like they have an angel on one shoulder and a devil on the other shoulder. So who is winning, the angel or the devil? The Wall Street Journal opines in favor of the angel. Four years in the wilderness seem to have had the salutary effect of returning the Party of Lincoln to a focus on government reform and economic revival. …The surprise is how quickly the GOP has rebounded from the routs of 2006 and 2008, starting in the states. …The reform momentum has since gained speed as a reaction to the Obama Presidency. First in 2009 with Chris Christie in New Jersey and Bob McDonnell in Virginia, Governors from the East across the Midwest and through the Southwest have won on reform agendas that they have been able to implement to varying degrees. …The common theme is ‘s ability to finance them. The contrast of these GOP states couldn’t be greater with the union-dominated Democratic governments of Illinois, California and Connecticut, which resist reform and simply default to ever-higher taxes. …The reform impulse has carried over to Washington, thanks to the Congressional victories of 2010. …Much of the credit here goes to the Tea Party, which has used GOP primaries to elevate reformers and motivate incumbents to change or face defeat. I agree with much of the column, particularly the credit to the Tea Party and the indirect reference (“restraining governments that were growing far more rapidly than the private economy”) to Mitchell’s Golden Rule. But I’m more pessimistic about whether the GOP has truly learned the right lessons from the failures of Bush-Rove era. Take this quiz and see if you share my qualms. If Mitt Romney wins and proposes to burden the U.S. economy with a value-added tax, would a majority of Republicans rise up in revolt and oppose that dangerous idea? If Mitt Romney wins and decides to only make cosmetic changes to Obamacare, would most Republicans rebel and push to fully repeal the costly legislation? If Mitt Romney wins and endorses a new version of TARP, would the Republican caucus stand firm in opposition? To be blunt, I don’t think a majority of Republicans would do the right thing if these tests took place. The GOP leaders on the Hill, after all, are the same crowd that gladly supported all the reckless spending and foolish intervention of the Bush years. Yes, there are some fresh faces and Tea Party types who would stand with taxpayers, but I don’t think they’re anywhere close to being a majority of the GOP caucus. And don’t forget that the Republican establishment in Washington is heavily influenced by corrupt lobbyists – many of them former GOP politicians! So what’s it all mean? Well, as the cartoon indicates, Republicans are now more likely to say the right thing. But rhetoric is easy. I’m much more interested in their actions. The only great president of my lifetime famously said “trust, but verify.” But I don’t even trust the GOP, so I definitely want to see results first. P.S. If you like the cartoon, you’ll like this poster featuring Ron Paul and this English-to-Republicanese dictionary. I’ve done a few comparisons of economic performance under Reagan and Obama, sometimes using the interactive data from the Minneapolis Federal Reserve Bank. And I’ve done a few TV interviews on the same subject. But something was very different in this interview on the Fox morning show. I was asked to respond to the Obama campaign’s assertion that Barack Obama’s policies created more private-sector jobs than Ronald Reagan’s policies. I confess that I did the interview without first checking the numbers, and may not have been overly animated since I was in Denver and had to wake up before 4:00 a.m., but I felt confident enough to joke about an intern torturing data in the bowels of the White House. But now that I’m back at my desk and I’ve had a chance to review the numbers from the Bureau of Labor Statistics, I can now say, with full confidence, that Stephanie Cutter must be smoking crack (she’s also smoking hot, but that’s a separate discussion). And her intern should be fired. Here are the numbers for private sector jobs (technically “Private wage and salary workers”), looking at the first 42 months in office for both Reagan and Obama. I’m including both seasonally adjusted and raw numbers, just to show that there’s no way to slice the data to justify Ms. Cutter’s assertion. And here’s a look at the comparative performance of Reagan and Obama, based on the percent increase in private jobs in the first 31 months. I also looked at what would happen if agricultural and/or self-employed workers were added to the mix, but nothing changes. 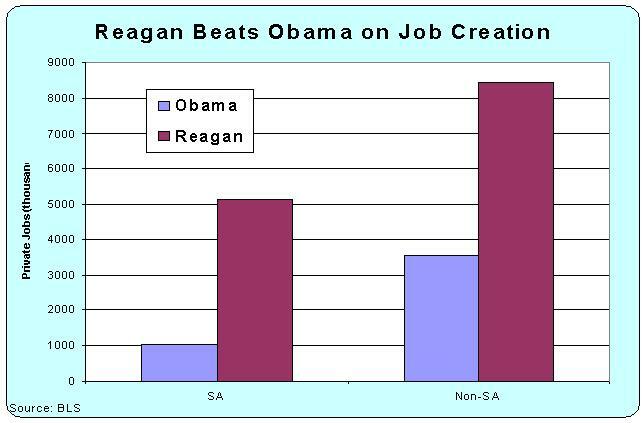 Reagan beats Obama with both hands tied behind his back. And what makes these numbers even more stunning is that Obama took office in the middle of a downturn, so a lot of the job losses already had occurred. 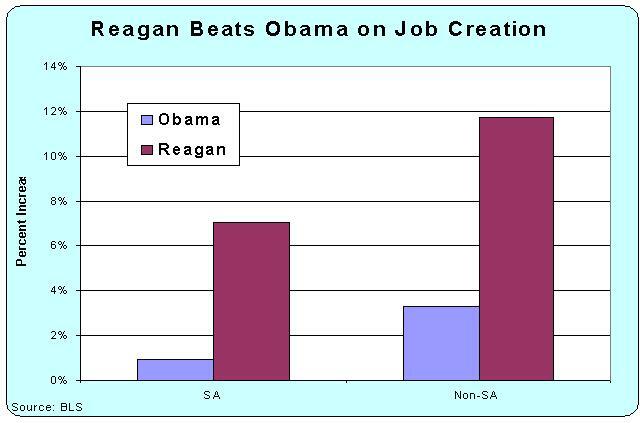 Reagan, by contrast, got hit with a recession after taking office. So even though I think that downturn can and should be blamed on Jimmy Carter, all of the job losses show up in Reagan’s column. Yet he still kicks the you-know-what out of Obama. The lesson to draw from these numbers is that Presidents should reduce the burden of government if they want better economic performance. Saint Ronald understood this basic insight, but Barack the Destroyer somehow thinks America will be more prosperous if we mimic Europe’s welfare states. I’m never guilty of being an optimist, but two items caught my attention today that suggest the tide may be turning on entitlement reform. We’ll start with something from the New York Times. Regular readers know that I’ve criticized that paper on a few occasions. Sometimes it’s because of silly editorializing, such as this bit of amateur political analysis by Thomas Friedman, this foolish look at international taxation by the editors, and this laughable column arguing that America should copy Italy’s fiscal policy. I also hit them for ignorant reporting, such as the story implying that things are free when they’re financed by government, this column that inadvertently makes the opposite point from what was intended, and this story mis-characterizing tax reform. Paul Krugman, needless to say, is in a league of his own. I’ll just cite this beatdown about Estonia and leave it at that. But it’s also important to cite good journalism when it occurs, and a new story in the New York Times on healthcare is a prime example. It’s straightforward and unbiased. And it shows the benefits of even small steps in the direction of markets. Here’s some of what Robert Pear wrote. Pear’s article raises an interesting issue about incremental reform. Proponents of liberty and markets obviously don’t like government-financed healthcare, but there are very-bad ways of doing the wrong thing and there are less-bad ways of doing the wrong thing. That’s never an argument for doing something bad, but if bad policies already are implemented, then it does make sense to grab any opportunity to make those policies less destructive. Ideally, we should restore free markets overnight. But given the constraints of the political system, I’ll gladly take the modest reforms that Paul Ryan is proposing for Medicare and Medicaid. Here’s a back-on-the-envelope image I created to show the spectrum of healthcare policy. It’s obviously very simplified, but I think the overall point about Ryan’s reforms being very incremental is correct. One final point about the political implications. President Obama clearly wants to scare seniors into thinking that the Ryan reforms are radical, but this is why the New York Times article is significant. It shows that Ryan isn’t proposing anything unusual, and it shows that the incremental reforms being proposed have a successful track record. This may be why we’re now seeing some remarkable poll results. Despite a furious onslaught of negative ads and harsh rhetoric, neither President Obama nor Mitt Romney has much of an advantage on critical issues heading into the fall campaign. …On Medicare — long considered a political vulnerability for Romney and his running-mate Paul Ryan — 49 percent of likely voters say Obama would handle the issue better while 48 percent prefer Romney. On health care, voters are just as divided — with 49 percent favoring Obama’s policies and 48 percent favoring Romney. P.S. Since I’m favorably commenting on an article from the New York Times, allow me to remind you that the paper does publish good material every so often. They allowed this great column on tax sovereignty on their editorial pages, this powerful expose of IRS abuse by a business columnist, and this great graphic on the connection between big banks and government bailouts in Europe. When I give speeches about entitlement reform, I often make the point that there’s nothing radical about Paul Ryan’s plan to reform Medicare. Spending will go up, for instance, not down. And the reforms only affect people under age 55. This is evolutionary change, not revolutionary change. But my main example is that future seniors, for all intents and purposes, will have a health plan similar to what’s now available for Members of Congress. Not only the politicians, but also their staff and the entire federal bureaucracy. I’m not the only one to think this is a powerful point. Here are a couple of passages from Deroy Murdock’s National Review column on the topic. The Medicare-reform proposal of presumptive GOP running-mate Paul Ryan is precisely as extreme as the health plan available today to every member of Congress. Ryan envisions average seniors’ being able to enjoy Capitol Hill–style medical options. This itself, however, would be a choice. Seniors who oppose choice in health coverage will be 100 percent welcome to remain within traditional Medicare. …Wyden-Ryan mirrors the way federal legislators buy health insurance. As FactCheck.org’s Brooks Jackson notes, “House and Senate members are allowed to purchase private health insurance offered through the Federal Employees Health Benefits Program, which covers more than 8 million other federal employees, retirees and their families.” …As FactCheck.org, elaborates, “All plans cover hospital, surgical and physician services, and mental health services, prescription drugs and ‘catastrophic’ coverage against very large medical expenses . . . There are no exclusions for preexisting conditions.” Participants may change plans during annual “open season” periods. Also, the government pays 72 percent of the average worker’s premium, with a maximum of 75 percent. Democrats cannot explain why Medicare recipients need to become congressmen to enjoy such choices in health coverage. If Ryancare, in essence, is good enough for senior citizens like Nancy Pelosi and Harry Reid, it’s good enough for any senior who wants it after 2022. Deroy’s column shows how supporters of entitlement reform can counter some of the left’s demagoguery. He’s making a point about political salesmanship, but it’s also important to understand why Medicare modernization is good healthcare policy. Simply stated, the main healthcare problem in America is the third-party payer crisis. As explained in this video, markets are dysfunctional when government programs and other forms of intervention create a system where 89 cents out of every healthcare dollar is paid for by somebody other than the consumer. Ryan’s Medicare reform doesn’t directly address this problem, just as block-granting Medicaid and reforming the tax system don’t automatically restore a market-based approach. But if a sufficient share of future seniors use their premium support vouchers to buy high-deductible catastrophic insurance policies (which presumably will be the smart approach), then a growing share of routine medical expenses will be purchased directly by consumers – thus slowly but surely returning market forces to healthcare. So I fully agree with Deroy that there are smart ways to promote the Ryan Medicare reforms. But I also want people to understand what it is that we want to accomplish. I elaborate in my video on Congressman Ryan’s proposed Medicare reform. Last but not least, check out this chart and you’ll begin to understand the potential benefits of fixing the third-party payer problem. P.S. The current version of the Ryan plan, now known as Ryan-Wyden, is not as good as the original version because it keeps the current Medicare system as an option. Like Sweden and Denmark, Germany is a semi-rational welfare state. It generally relies on a market-oriented approach in areas other than fiscal policy, and it avoided the Keynesian excesses that caused additional misery and red ink in America (though it is far from fiscally conservative, notwithstanding the sophomoric analysis of the Washington Post). Nonetheless, it’s difficult to have much optimism for Europe’s future when the entire political establishment of Germany blindly thinks there should be more centralization, bureaucratization, and harmonization in Europe. The EU Observer has a story about the agenda of the de facto statists in the Christian Democratic party who currently run Germany. …what Merkel and her party are piecing together is a radical vision of the EU in a few years time – a deep fiscal and political union. The fiscal side involves tax harmonisation, a tightly policed Stability and Growth Pact with automatic sanctions for countries that breach debt and deficit rules, and the possibility of an EU Commissioner responsible for directly intervention to oversee budgetary policy in a crisis-hit country. …On the institutional side, the CDU backs a directly elected President of the European Commission as well as clearly establishing the European Parliament and Council of Ministers as a bi-cameral legislature with equal rights to initiate EU legislation with the Commission. Keep in mind that the Christian Democrats are the main right-of-center party in Germany, yet the German political spectrum is so tilted to the left that they want tax harmonization (a spectacularly bad idea) and more centralization. Heck, even the supposedly libertarian-oriented Free Democratic Party is hopelessly clueless on these issues. Not surprisingly, the de jure statists of Germany have the same basic agenda. Here’s some of what the article says about the agenda of the Social Democrat and Green parties. …its commitments to establish joint liability eurobonds and a “common European fiscal policy to ensure fair, efficient and lasting receipts” would also involve a shift of economic powers to Brussels. While both sides have differing ideological positions on the political response to the eurozone crisis – they are talking about more Europe, not less. The notion of eurobonds is particularly noteworthy since it would involve putting German taxpayers at risk for the reckless fiscal policies in nations such as Greece, Italy, and Spain. That’s only a good idea if you think it’s smart to co-sign a loan for your unemployed and alcoholic cousin with a gambling addiction. All this makes me feel sorry for German taxpayers. Then again, if you look at the long-run fiscal outlook of the United States, I feel even more sorry for American taxpayers. Thanks to misguided entitlement programs, we’re in even deeper trouble than Europe’s welfare states.